Warren seniors Margo Loutzenhiser, Sierra Matson and Alanna Hultberg were honored prior to the start of a game against Corry at Warren Area High School, Monday, Feb. 11, 2019. The trio combined for 22 points in their final home game to lead the Dragons to a 51-13 win over the Beavers. 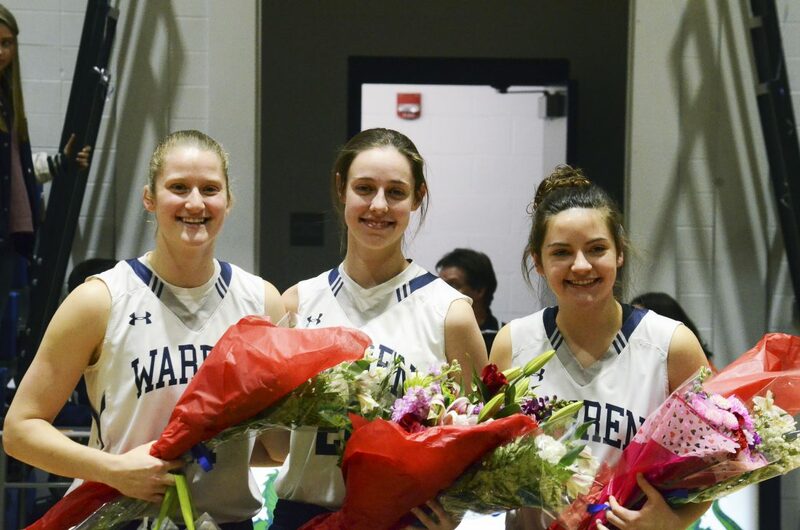 The Warren Lady Dragons had plenty of time to celebrate the contributions made by their seniors on Senior Night. They held visiting Corry without a field goal through the first three quarters on their way to a 51-13 Region 6 win Monday. The program recognized seniors Alanna Hultberg, Margo Loutzenhiser and Sierra Matson prior to tipoff. 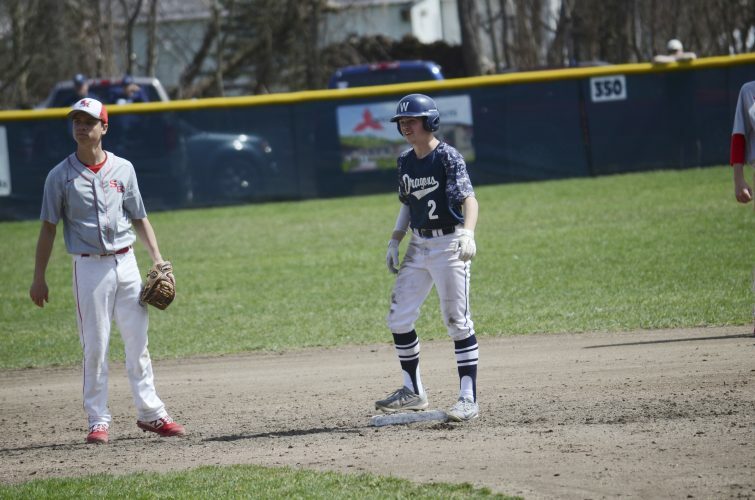 Loutzenhiser and Hultberg helped get Warren (18-3 overall, 8-2 Region 6) off to a fast start as the pair combined to score nine of the Dragons’ 19 first quarter points. The stifling defense kept Corry (4-18, 0-10) off the board in the first quarter. 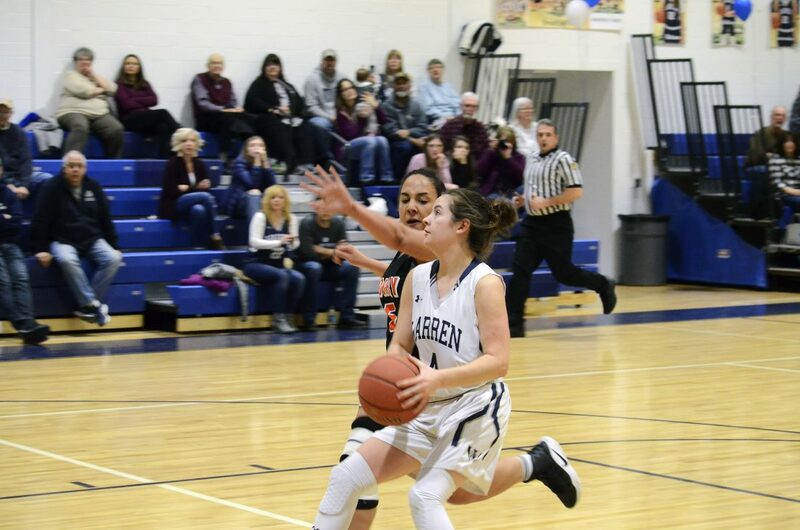 Warren scored the first 27 points of the game before Corry finally broke through with a Davia Fisher free throw with 3:22 remaining in the first half. Miranda Nickerson hit a second free throw later in the quarter, but the half belonged to the Dragons who held a 40-2 lead at halftime. Warren senior Margo Loutzenhiser (left) discusses the finer points of basketball with kindergartener Paiton Jones, 6, prior to Monday night’s matchup at Warren Area High School. 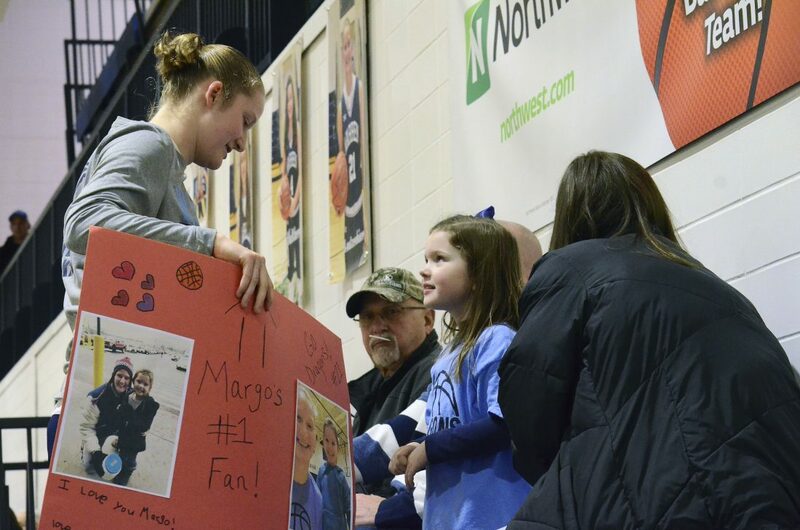 Jones brought a homemade sign supporting Loutzenhiser, who played her final home game as a Lady Dragon. 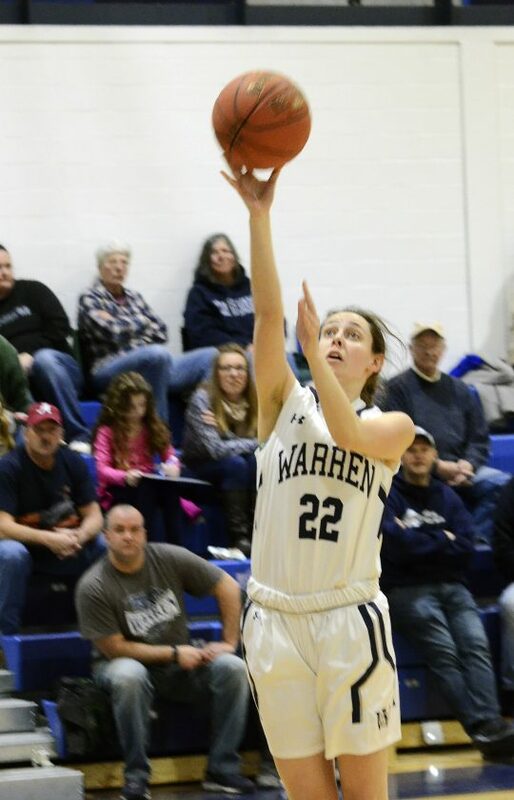 Loutzenhiser assisted Jones with her jump shot following the Warren victory, picking up where they left off during the Warren Lady Dragon Basketball Camp in January. The Dragons blanked the Beavers again in the third quarter, and LaVan was able to bring her seniors off the floor early in the fourth quarter to a rousing ovation from the home crowd. Riley Childress had a game-high 14 points. Loutzenhiser had 13 points and eight rebounds and Emma Ruhlman had six points, 13 rebounds and five steals. 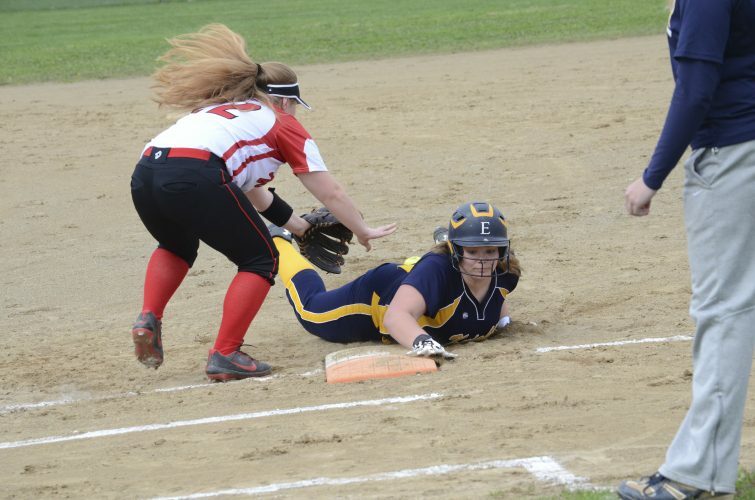 Hultberg closed out her home career with five points and Matson four. 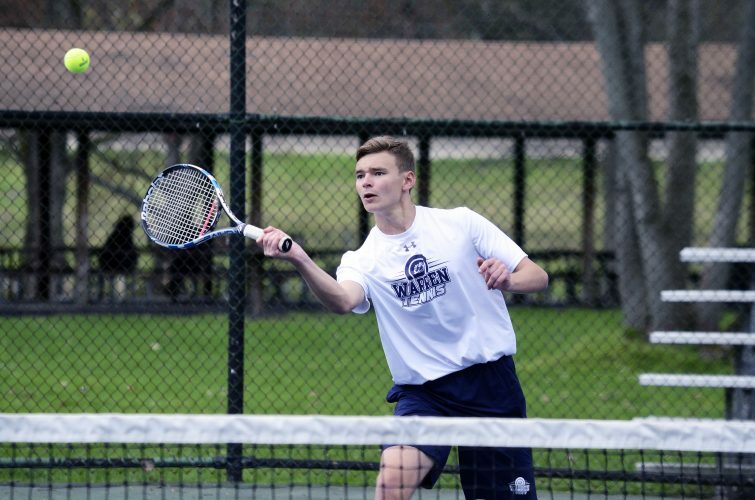 Warren also finished the regular season undefeated at home for the first time in five years. Warren’s Sierra Matson (22) puts up a layup during the first half of a game against Corry at Warren Area High School, Monday, Feb. 11, 2019. Matson, a senior playing in her final home game as a Dragon, scored four points and Warren rolled to a 51-13 win over the Beavers. Still, the victory was bittersweet. LaVan tweeted early in the day how she felt about losing such talented players and reiterated it again after the game. Warren won the junior varsity game, 32-22. Katie Madigan had a game-high 20 points and Halee Mineweaser nine in the win. Warren’s Alanna Hultberg (4) tries to get past Corry’s Davia Fisher (5) during the first half of their game at Warren Area High School, Monday, Feb. 11, 2019. Hultberg, playing in her final home game in a Warren uniform, had five points to help lead the Dragons to a 51-13 win over the Beavers. 3-point FGs: Corry (1)-Frisina. Warren (2)-R. Childress, T. Childress.